Power Systems International transfer switches. 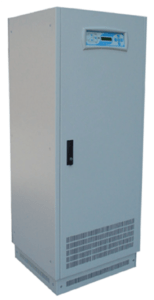 Designed to provide switching between two independent AC power sources. Transfer Switches ensure “highest availability” of the power supply to sensitive and critical applications. The installation of an Automatic Transfer Switch or Static Transfer Switch ensures 2N architecture is achieved and allows loads with single feeds to always be supplied by the highest quality of power. The use of transfer switches and 2N architecture increases the maintainability of the switch panels and upstream equipment.